Sheldon Best in Six Rounds of Vengeance. Photo by Theresa Squire. BOTTOM LINE: The latest Vampire Cowboys joint treads familiar territory; first-time viewers may enjoy it more than long time fans, but there is still plenty of fun to be had. It's a good time to be a New York City geek. There's a new Mortal Kombat game out, Avengers: Age of Ultron just opened, and Vampire Cowboys is putting on another show. I’ve been following Vampire Cowboys since 2010; I saw their production of Alice In Slasherland and I was hooked (yes, I know I missed Soul Samurai...I’ve read the script, I’ve done all I can, don’t tell me about how amazing it was again). For me, watching a Vampire Cowboys show is like immersing myself in a pool of liquid joy. With ninjas. Just saying the name “Vampire Cowboys” makes me smile. I get the same sort of sense of fuzzy nostalgia one might get thinking about a favorite comic book or cartoon show from their childhood. With ninjas. Writer/fight choreographer Qui Nguyen, director Robert Ross Parker, producing badass Abby Marcus and the rest have been doing their thing for almost fifteen years. In that time, they've taken New York Comic Con by storm, received honors from the Obies and the New York Innovative Theatre Awards, trained actors at their Rabid Vamps Fight Studio and hosted free monthly plays at their Saturday Night Saloon series. 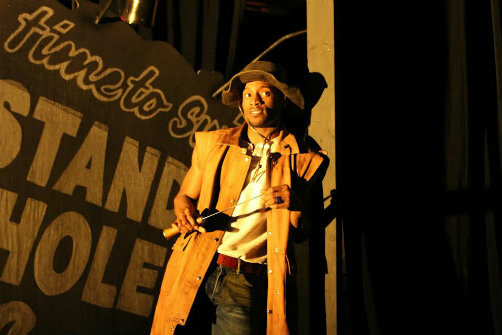 If Vampire Cowboys has seemed to acquire an almost mythological standing in the New York indie theatre scene, it is because the company has worked hard to establish an impressive legacy. With their newest production, Six Rounds of Vengeance, Vampire Cowboys look to their most successful work for inspiration. Set in the same universe as the critically acclaimed Soul Samurai, this "sideways sequel" follows a group of scrappy survivors fighting off "long tooths" in the desert wasteland that was once Las Vegas. Former cop Malcolm (Sheldon Best) teams up with mercenaries Jess (Jamie Dunn) and Lucky (Tom Myers). While Jess and Lucky scrape out a living mowing down the undead, Malcolm has a more personal stake in his fight: avenging the death of his husband (Jon Hoche) who succumbed to the villainous Queen Mad (Nicky Schmidlein). Comparisons will inevitably be made to Soul Samurai, since Six Rounds of Vengeance hits many of the same beats. Nguyen's Whedon-esque writing style can also be polarizing to some: you will either love the characters' quirky verbosity or you won't. However, what has always made Vampire Cowboys shows more than mere sword-slashing spectacles are the lovingly drawn characters and the relationships that motivate them. Malcolm's relationship with his husband Nathaniel, revealed in flashbacks, feels natural and lived in. Jess and Lucky's unresolved romantic yearnings are also touching and sweet. Even the big bad has somewhat justifiable motivation for her descent into evil. Queen Mad gets a chance to tell her side of the story, and in Nguyen's text Mad's realization of her killer instinct emerges as a kind of spiritual awakening. But there is still plenty of that entertaining violence that has made Vampire Cowboys famous. Nguyen expertly combines elements of swordplay, kung fu, capoeira, professional wrestling and other fighting styles to create a unique martial arts aesthetic. As directed by Parker, the show has a wry cinematic feel, as actors break into sudden bursts of slow motion and picture frames "zoom in" on key moments. The technical elements also elevate the show: Nick Francone's stunning set, Kristina Makowski's edgy costumes, and David Valentine's imaginative puppets are all visual treats and add considerable color to the play's mythology. The performers of Six Rounds of Vengeance are solidly great. Veterans of past Vampire Cowboys shows, the cast are effective actors as well as impressive athletes. It is especially nice to watch Best and Hoche bringing life to the relationship at the show's heart. Schmidlein stole the show for me with her deliciously villainous turn as the fetish gear-sporting vampire queen. Schmidlein has a hell of a lot of fun descending into the depths of depravity. Six Rounds of Vengeance may not be Vampire Cowboys' most memorable show, but even just an okay Vampire Cowboys production is better than ninety-nine percent of what's out there. I say go see it, and let your inner geek come out to play.